The first week of the 2015 Kansas high school football season had a number of story lines. Most notably, the top four teams in the Class 5A rankings all lost in Week 1. Three teams in the Class 4A-II poll also lost on Friday. Find out how that impacts the Kpreps Top 5 by visiting our Rankings page. In Class 6A, defending champion Shawnee Mission East opened with a dominant 45-0 shutout over Gardner-Edgerton. Blue Valley remains at No. 2 this week after quarterback Colton McCumber totaled more than 330 yards of total offense in the Tigers’ 62-27 win over Shawnee Mission Northwest. Derby trailed 20-7 at halftime, but the No. 3 Panthers rallied in the second half to top Maize 42-20. Lawrence, ranked fourth, bested then 5A No. 4 Blue Valley West 35-14, and Topeka High remains at No. 5 after a 42-0 shutout of KC Schlagle. The Class 5A world was turned upside down on Friday as the top four teams in the classification all lost. Mill Valley, ranked fifth last week, knocked off preseason No. 1 St. Thomas Aquinas 38-20 behind a big game from quarterback Logan Koch. The Jaguars ascend to the top as the new No. 1 this week. Aquinas, which played without all-state running back James Cosentino, drops one spot to No. 2 this week. Defending champion Bishop Carroll lost 31-24 to Wichita Northwest to open the season. The Golden Eagles fall one spot to No. 3 this week. Preseason No. 3 Salina South lost 14-7 to McPherson and fell out of the top five this week. The remainder of the poll features Kapaun Mt. Carmel at No. 4 and Pittsburg at No. 5. Kapaun beat Wichita East 35-20 on Friday, while Pittsburg blasted Coffeyville 57-14. In Class 4A-I, the only change in this week’s poll occurs at No. 5 where the Paola Panthers enter the rankings after a 60-25 win over Spring Hill. Paola’s Nathan Staats rushed for 296 yards and seven touchdowns in the win. Paola replaces preseason No. 5 Fort Scott after the Tigers struggled to get by Parsons, 24-7. 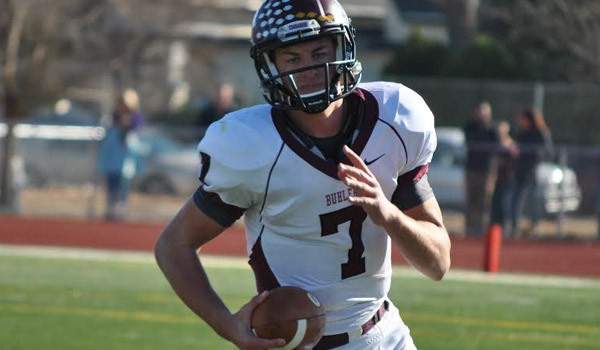 Buhler remains at No. 2 after posting an impressive 16-0 shutout of preseason 4A-II No. 1 Andale. The win was the first for the Crusaders in 25 years. Holcomb is the new No. 1 in 4A-II, switching places with Andale after the Indians loss at Buhler. The Longhorns beat Cimarron 48-8 behind 270 passing yards and three touchdowns from quarterback Trey Teeter. Andale falls one spot to No. 2 in this week’s poll, while Columbus moves up to No. 3 after a 64-26 win over Chanute. The Holton Wildcats are ranked fourth this week; down one spot after a 23-22 overtime loss at Class 3A’s No. 5 team Silver Lake. Finally, Osawatomie enters the poll at No. 5 after the Trojans got a late touchdown from all-state running back Riley England to top previous No.5-ranked Frontenac, 41-37. The top five teams in Class 3A remain unchanged in this week’s poll. Scott City received a strong test from Clearwater in a 30-15 win, while Silver Lake held on to beat Holton in overtime as mentioned above. Top-ranked Rossville handled an experienced Clay Center team 48-13, and Wichita Collegiate was dominant in a 75-0 shutout of Rose Hill. Halstead remains at No. 4 this week after a 48-6 win at Haven. The Dragons get a big challenge this week when they host Hesston. In Class 2-1A, Meade remains at No. 1 after cruising to a 55-6 win over Leoti-Wichita County. Phillipsburg opened with a 35-0 shutout of Thomas More Prep, but the Panthers will get a big test this week when they host Mid Continent League rival Norton. Sedgwick moves up one spot this week to No. 3 in the poll after a strong showing against Hutchinson Trinity. The Cardinals replace defending champion Olpe at No. 3 after the Eagles fell 22-12 to the new No. 4 ranked La Crosse Leopards. Marion remains at No. 5 after a 24-14 victory over Moundridge. The battle of defending 8-Man champions went the way of Division II’s top-ranked Victoria Knights. The Knights outlasted Division I’s top-ranked Central Plains 16-12 in a defensive struggle. Victoria led 16-6 at halftime and held on for the win. As a result of Central Plains’ loss, Spearville switches places with the Oilers in this week’s poll. The Royal Lancers shut out consistent contender Madison 46-0 to open the season. Rounding out the poll, No. 3 Wakefield, No. 4 Udall, and No. 5 Solomon each posted big wins. Wakefield will travel to Solomon this week for a crucial Wheat State League showdown. The majority of the 8M-II poll also remains the same this week. As mentioned above, Victoria remains at No. 1, while Sharon Springs-Wallace County is ranked second after a strong showing at Atwood-Rawlins County last week. Ingalls used its speed to blow past South Gray, and No. 4 Argonia-Attica pulled away from an improved Sedan squad. Preseason No. 5 Axtell fell at Twin Valley League rival Hanover 48-22 and falls out of this week’s poll. Beloit St. John’s-Tipton enters this week’s poll at No. 5 after a 40-12 win over Hill City. The Blujays get a tough test this week at Osborne.